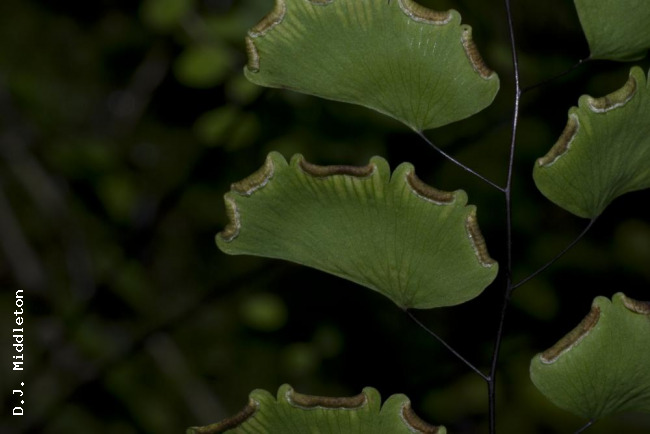 Adiantum philippense L., Sp. Pl. 2: 1094. 1753; Tardieu & C.Chr., Fl. Indo-Chine 7(2): 182. 1940; Holttum, Rev. Fl. Malaya ed. 1, 2: 598, f. 350. 1955 [‘1954’]; Holttum, Dansk Bot. Ark. 20: 33. 1961; Holttum, Dansk Bot. Ark 23: 244. 1965; Ching, Acta Phytotax. Sin. 6: 318. 1957; Tagawa & K.Iwats., SouthE. Asian Stud. 5: 119. 1967; Tagawa & K.Iwats., Fl. Thailand 3: 211. 1985; Boonkerd & Pollawatn, Pterid. Thailand: 99. 2000; Boonkerd & Pollawatn, Pterid. Thailand: 118. 2000; Newman et al., Checkl. Vasc. Pl. Lao PDR: 31. 2007. Adiantum lunulatum Burm.f., Fl. Ind. : 235. 1768; Bedd., Handb. Ferns Brit. India: 82, f. 43. 1883; Hosseus, Beih. Bot. Centralbl. 28(2): 363. 1911; Bonap., Notes Ptérid. 14: 61. 1923. Terrestrial or lithophytic. Rhizome short, suberect, the apex covered with scales; scales linear, a little broader at base, entire, up to 3 mm long, bicoloured. Stipes bright castaneous to black, glabrous or sparsely scaly at basal portion, variable in size, usually about 10 cm long; scales on stipe like those on rhizome except in being concolorous brown. Laminae linear-lanceolate to oblong, pinnate, commonly 15 cm long but the larger more than 30 by 10 cm; rachis perfectly glabrous, occasionally prolonged, leafless on upper part, and rooting at tip, more commonly bearing an apical pinna like lateral ones; lateral pinnae large at base, slightly reduced in size upwards, distinctly stalked; stalks usually 5–10 mm but sometimes more than 2 cm long, with an angle of about 60° to rachis; leaflets crescent-shaped, 0.8–6 by 0.5–2.7 cm, in the upper leaflets the lower two edges meeting at stalks to form cuneate base; thin, softly herbaceous, glabrous on both surfaces; veins a little raised, outer edge of leaflets subentire, crisped or lobed to about 1/4 of breadth of leaflets, sinus narrow, lobes round to subquadrangular, round to truncate at subentire or toothed apex. Sori at margin of leaflets, reflexed soral flaps elongate , usually 5–8 mm long, but up to 1.5 cm. NORTHERN: Mae Hong Son, Chiang Mai, Chiang Rai, Lamphun, Lampang, Tak, Phitsanulok; NORTH-EASTERN: Phetchabun, Loei; SOUTH-WESTERN: Kanchanaburi; CENTRAL: Nakhon Nayok, Bangkok; SOUTH-EASTERN: Prachin Buri, Chon Buri, Chanthaburi; PENINSULAR: Krabi, Nakhon Si Thammarat. Attapeu, Champasak, Luang Phrabang, Vientiane. Kampot, Kompong Chhnang, Mondulkiri, Siem Reap. Throughout the tropics of the Old World. On rather dry slopes or on muddy crevices of rocks in light shade or sometimes on humus-rich floor of dense montane forests; common at low to medium altitudes, rarely to 1400 m alt., very common except in Peninsular region. 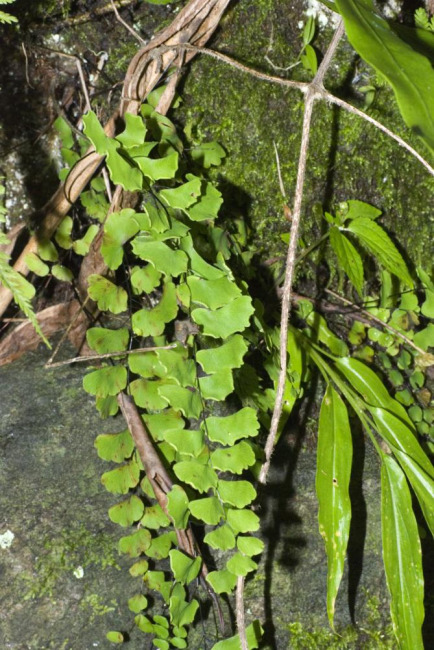 Owing to its wide range of habitats, the size and texture of this species are highly variable. Leaflets become larger and thinner in deep shade, and in open limestone areas the plants are somewhat dwarfed. Middleton et al. 4477, Chiang Mai, Doi Suthep-Doi Pui National Park (E); Larsen et al. 43359, Krabi, Klong Chilat (P). Maxwell 99-128, Vientiane (CMU); Maxwell 97-1189, Champasak (CMU). Petelot 220, Kompong Chhnang (P); Schnell 10301, Mondulkiri, near Gatille (P); Long et al CL345, Mondulkiri (P); Long et al CL278, Siem Reap, Taprom Temple (P).